An enormous weather balloon in Antarctica spotted what looked like a high-energy particle from outer space striking the ice back in 2006. Except the particle didn’t hit from above—it somehow traveled all the way through the planet. Eight years later, it happened again. Once is happenstance, but two events like this mean that it’s something to take seriously. Some scientists think the signal may have come from something unexplained by the currently understood rules of particle physics. That would be a big deal—a new fundamental particle, and of course, a potential explanation for the Universe’s dark matter. “It breaks the Standard Model for a particle with that much energy to travel through the Earth,” Derek Fox, a Penn State physicist who led the most recent analysis, told Gizmodo. Some celestial objects blast high-energy cosmic rays toward Earth. Their collision with the atmosphere can create a shower of secondary particles or radio signals. 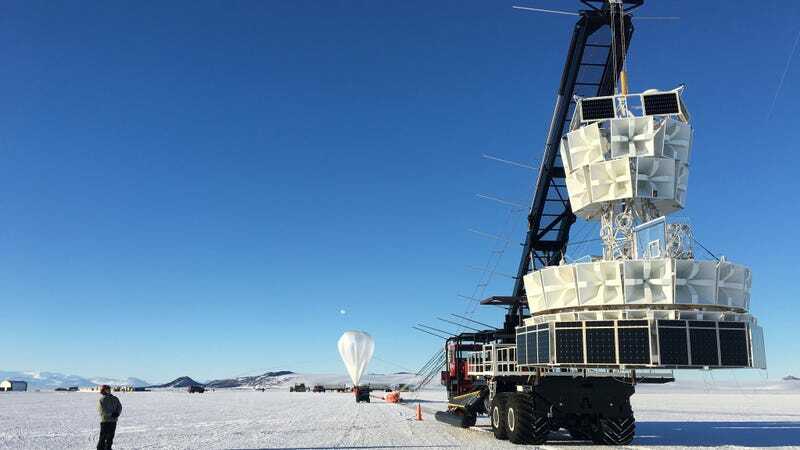 There are experiments set up to observe those signals, like the Antarctic Impulsive Transient Antenna (ANITA) experiment on a large balloon. Except, usually these particles ping the antenna after striking the Earth from above, producing a radio signal reflected off of the Antarctic ice. High-energy neutrinos might also hit the Earth moving at a low angle with the ground, producing a radio signal for ANITA to see. The 2006 and 2014 signals looked wrong, though—they didn’t have the signature of particles that came from above, but rather from ones that traveled through the Earth, according to a March paper. After ruling out potential radio interference and other sources, ANITA scientists determined they’d spotted something they called “unusual”—perhaps a particle with energies tens of thousands of times higher than the highest-energy collisions at the Large Hadron Collider. Fox and his collaborators analyzed the properties of the wild events and presented calculations demonstrating that the particle physics rulebook, called the Standard Model, can’t explain how a particle with this much energy could have made it through the Earth. They published their results on the arXiv physics preprint server, meaning that the paper hasn’t yet been peer reviewed. The team also found corroborating evidence for these strange particles in the IceCube experiment buried in the Antarctic ice. Perhaps these IceCube events were high-energy muons, a heavier cousin of the electron, but Fox’s team’s analysis found that unlikely. Instead, they thought they were observing even heavier cousins of the muons, called taus. If the signals were upward-moving taus, they would have been the decay product of some other weakly interacting particle that could travel through the Earth. That particle would be called the stau (rhymes with cow) particle, Fox proposed. Some scientists predict that every particle in the Standard Model, from the quarks to the Higgs boson, have a corresponding heavier “supersymmetric” particle partner. The tau’s partner would be called the stau. Some high-energy neutrino could have interacted with the elements below the surface of the opposite side of the planet, creating staus that traveled through the planet and then decayed into the tau. That tau was potentially observed by IceCube and perhaps produced the radio signal observed by ANITA. Theoretical physicists had previously predicted the possibility of a stau with properties similar to whatever ANITA spotted. A stau with about 500 times the mass of a proton and with the energy observed by ANITA should travel most of the way through the Earth before decaying. “My simple-minded perspective as an observer is, if I find some bizarre phenomenon and find that it’s predicted by some theorist before the phenomenon was seen, that’s a big deal for me,” said Fox. But given some of the recent angst about the fact that the Large Hadron Collider in Geneva, Switzerland has not found any new particles since the Higgs boson, as well as the continued non-detection of the dark matter that supposedly makes up five-sixths of the Universe’s mass, physicists are excited about this paper. Denton wanted to see whether other experiments could spot similar results. Additionally, there’s more work to do before one can conclude that ANITA spotted a whole new particle. But it’s a tantalizing result at the limits of physics—and if it holds, then it’s almost a gift.